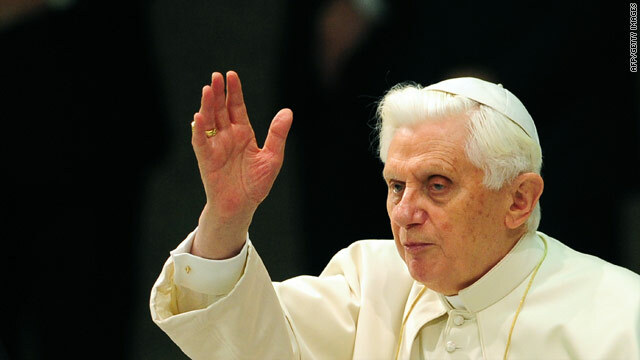 Pope Benedict XVI at his weekly general audience Wednesday. ROME, Italy (CNN) -- Pope Benedict XVI met privately on Wednesday with the woman who dragged him to the ground on Christmas Eve, the Vatican said. The pope offered forgiveness to Susanna Maiolo, 25, who jumped a barrier and dragged down the 82-year-old pontiff last month. Maiolo told the pope she was sorry about what had happened, according to a statement from the Vatican. She was detained by Vatican police and then taken to a mental institution, Vatican spokesman Father Federico Lombardi said at the time. The pope was quickly helped to his feet by his aides -- prompting cheers from the crowd -- and the service resumed, Lombardi said. Maiolo is the same woman who tried to get to the pontiff on Christmas Eve 2008, Lombardi said. John Allen, senior Vatican analyst for CNN, said such security breaches aren't uncommon. "As compared to say, the president of the United States, the security membrane around the pope is pretty thin and fairly permeable," he said, citing similar past incidents, including Maiolo's previous attempt. Allen said that, generally, these disruptions are caused by people who aren't seeking real harm, but who want to be close to the pope.